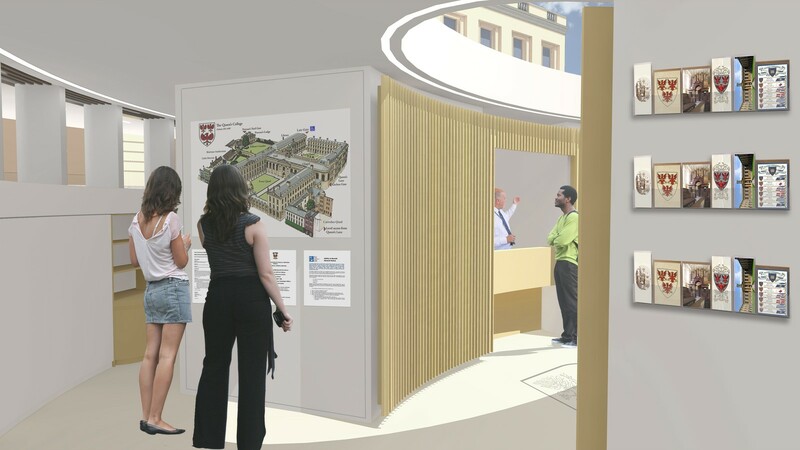 Our design for the Porter’s Lodge fuses pragmatic considerations with poetic aspirations to create a new sense of arrival to compliment and celebrate the peerless setting of the front quad of Queen’s College in Oxford. 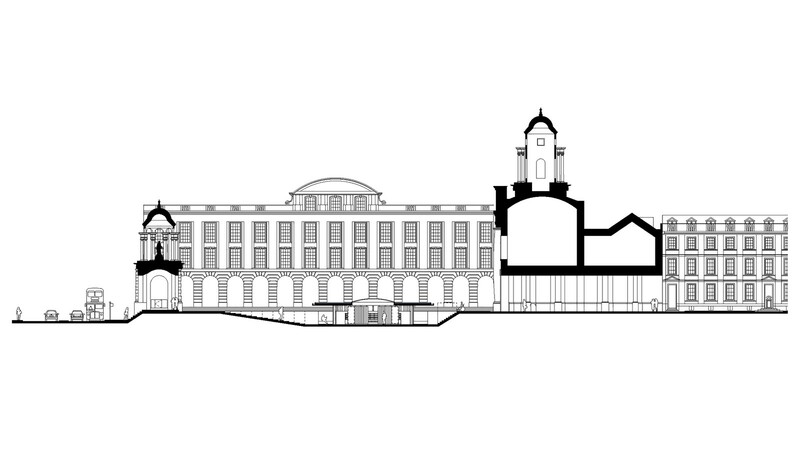 The placement of the porters’ lodge within the front quad is the key decision, which establishes design and architectural principles for the project. 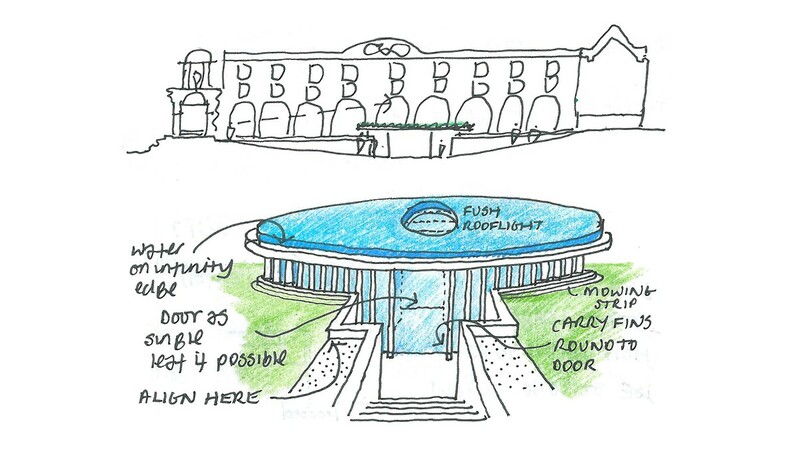 The new lodge is located within a semi interred circular building set under an oval pond on the main circulation axis. Placing the lodge within the quad allows the removal of all structures from the cloisters, restoring the original architectural serenity of the setting, whilst submerging the building within the grass will ensure its subservience to the surrounding architecture. 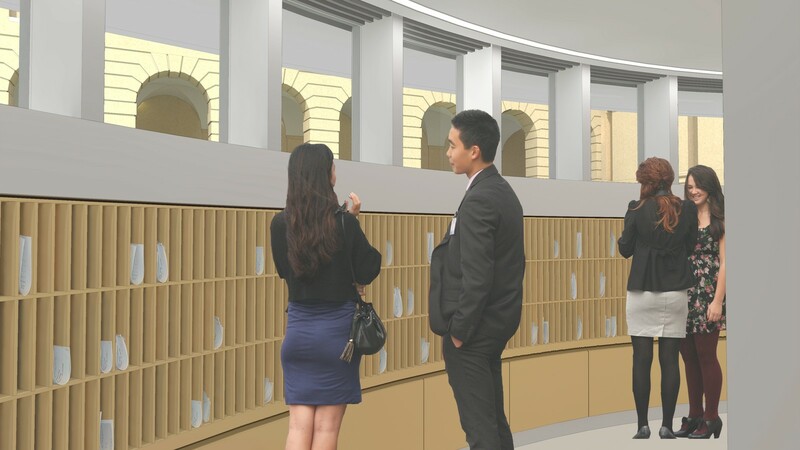 The new structure provides clear, flexible space to suit the demands of 21st century college life and enhances the sense of arrival, reinforcing vistas and creating new views of its own. 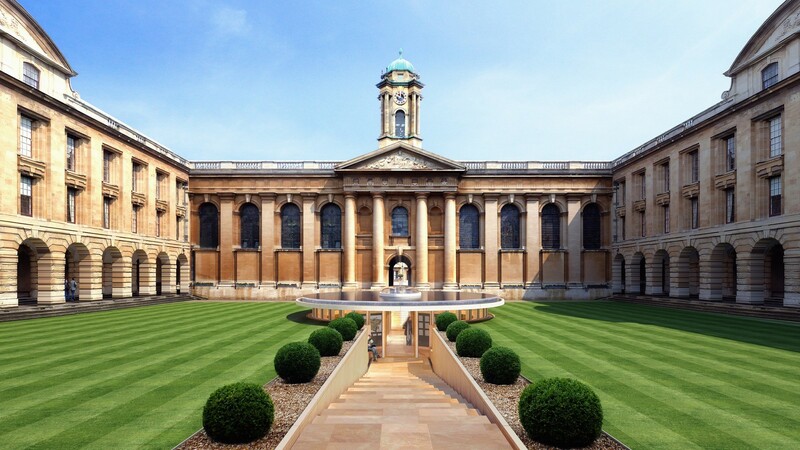 It introduces poise, elegance, dignity and architectural poetry to the quad. The soft circular and elliptical forms of the lodge help the building settle into the quad. The elegant symmetry of these traditional geometries creates balance and harmony with the original architecture. The elliptical shape of the roof relates to the curved pediments over the east and west elevations. The roof creates a shallow pond with finely detailed edges so as not to be overly assertive within the intimate setting. The elliptical form reinforces the primary axis through the quad and creates cantilevered sheltering canopies to the entry points of the circular building underneath. The water in the pond flows over an infinity edge and is collected in a concealed rim and recycled. Movement of the water introduces gentle sound to the quad and will prevent algae growth. Seen from the upper levels of the west and east ranges, the pond creates a pleasant outlook, reflecting its surroundings and the sky above. The new Lodge is approached from the entrance gate by shallow stone steps dropping down between retaining walls. The tapered form of this stair reinforces the sense of progression through the quad. At the base of the steps a stone bench either side of the entrance provides a sheltered place for people to sit and chat, emphasising the social role of the lodge in the place of college life. At the rear, steps rise up to the Hall/Chapel flanked by an elegant platform access lift with stone floor and a bronze and glass balustrade. York stone steps and Bath stone retaining walls to the grassed quad correspond to the surrounding paving and elevations of the quad, whereas the drum of the new building rises up in finely detailed concrete and glass as a signature piece of architecture and a destination echoing Hawksmoor/Townesend’s coffered dome and cupola of the entrance gateway. 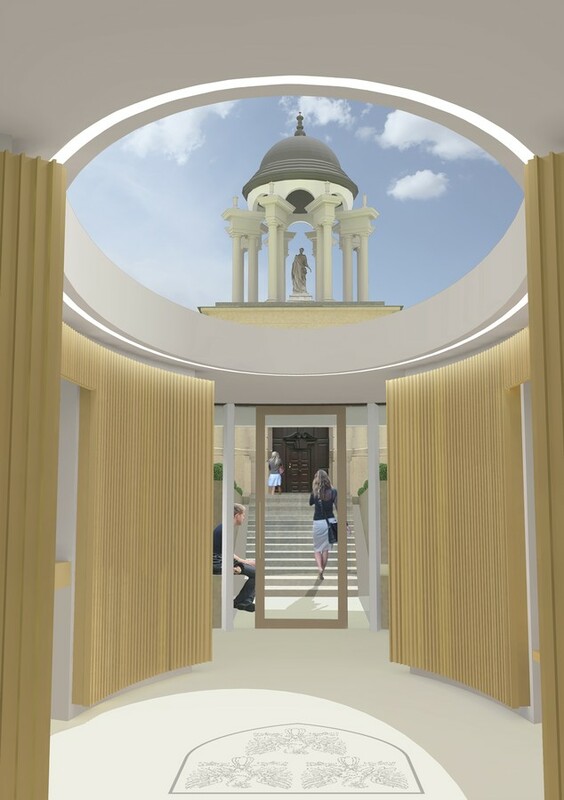 On entering the Porters’ Lodge an oval rooflight provides a striking view of the Hall/Chapel turret in one direction and entrance gate cupola in the other, emphasising the Lodge as a point-of-arrival en route inwards or outwards from the College. The external walling of the lodge is glazed between radiating fins, which are crisply wrought in white concrete pigmented with Portland stone, acknowledging the radiating double-columns of Hawksmoor’s Portland stone entrance cupola. The radiating fins carry the over sailing roof. The glazing allows views in and out. At night, light within the lodge will spill through the glazing to light the soffit of the cantilevered pond above so that the pond will appear to float over the lawn. At lower level the perimeter is formed by a white concrete drum incorporating recesses for pigeon holes, parcel shelves and general storage.